All Aboard Reading Station Stop 3 The Monitor: The Iron Warship ThatChanged the World: The Iron Warship That Changed the World is for Ages 4-8. 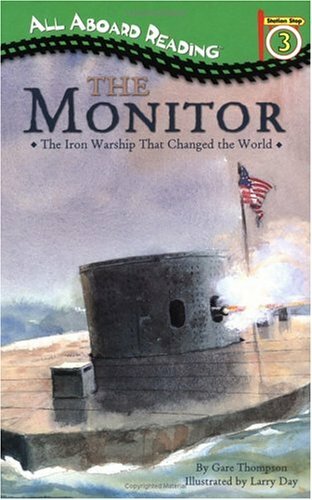 All Aboard Reading Station Stop 3 The Monitor: The Iron Warship ThatChanged the World: The Iron Warship That Changed the World was written by Gare Thompson. All Aboard Reading Station Stop 3 The Monitor: The Iron Warship ThatChanged the World: The Iron Warship That Changed the World was published by Grosset & Dunlap. Subjects of All Aboard Reading Station Stop 3 The Monitor: The Iron Warship ThatChanged the World: The Iron Warship That Changed the World include Children's Books/Ages 9-12 Science, Children: Grades 2-3, Hampton Roads, Battle of, Va.,, Hampton Roads, Battle of, Va., 1862, Hatteras, Cape, History - Military & Wars, History - United States/19th Century, Juvenile Easy Readers, Juvenile Fiction, Juvenile literature, Juvenile Nonfiction / History / United States / 19th Century, Monitor (Ironclad), North Carolina, Readers - Beginner, Readers - Intermediate, Shipwrecks, Transportation - Boats, Ships & Underwater Craft, Underwater archaeology, United States, and Virginia (Ironclad).